Raising children in this wild country to know, love, and serve the Lord. Welcome to Catholic Schoolhouse Green Bay!! 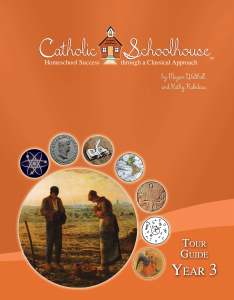 Catholic Schoolhouse is a supplemental program designed to help homeschool families in Northeastern Wisconsin enrich their educational experience through a flexible approach to learning inspired by classical elements. We have three main types of programs within our co-op: Dialectic (12-15 yrs), Grammar (4-12 yrs), and Nursery (1-4 yrs). We are open to considering a Rhetoric program (15-18 yrs), if we have enough interest. 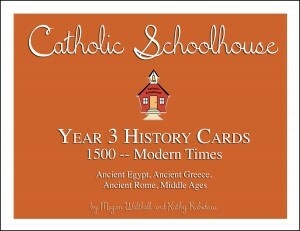 The whole family can have a place at Catholic Schoolhouse! Our program meets once per week for a total of 24 weeks from September to May. Our program runs from about 9:30am-1:30pm and includes time to enjoy lunch with friends and recess. We take one week off per month. We also have a break around Thanksgiving, Advent & Christmas, and Holy Week & Easter Week. Our year is divided up into quarters. Grammar scholars use the Tour Guide to learn about geography, history, religion, art, science, math, language arts, Latin, and fine arts. Our grammar scholars have weekly science experiments for 30 minutes, and a 30-minute weekly art class. Our dialectic scholars have alternate weeks of a 1-hour science experiment and a 1-hour art class. Dialectic scholars read, discuss, and write about one book per quarter. Socratic style discussions are used in the dialectic program. Having all scholars use the Tour Guide’s content facilitates family cohesiveness and simplifies lessons for home educators. At the dinner table, an 8th grader, 5th grader, and 2nd grader can all talk about physics, history, and art. The 8th grader will be able to go more in-depth into subjects than the younger siblings, but all children will be able to talk about the interesting things they learn. It is a one-room schoolhouse model! Scholars learn about 5 key events in history each week. Each card has a picture representing each event, and the back has several paragraphs for deeper learning for older scholars. In addition to a weekly co-op, we have quarterly Moms’ Nights Out and quarterly field trips. The field trips are chosen to complement content in the Tour Guide for that quarter. All memory work is set to music to make learning easier and fun! For the youngest children, we have an amazing nursery! They have a lot of time for free play. They enjoy story time, coloring time, and craft time. The children in the nursery love co-op day as much as the older scholars! It’s a joyful highlight in everyone’s week. We also work with local priests to have monthly Mass and Confession opportunities on site! Our co-op is more than a day out of the house; it can help bring structure and cohesiveness to your entire homeschool experience and will bless your family. 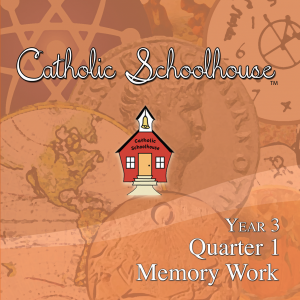 To see some of the fun we’ve had at Catholic Schoolhouse, please visit our blog here! To learn about the cost to join, please go here. Living the Liturgical Year: Advent Fiesta!